We invite you to explore India - the Land with infinite beauty ! Whether you soar high into Himalayas or peer under the ruins of the Ancient monuments dotting the landscape of India, you will cherish the experience long after your visit ! This India Travel Guide on Mount Mary Basilica Bombay is free from any commercial interest! This site is dedicated to promote India - the vast subcontinent, its glorious past, magnificent landscape and its infinite variety. Standing on a hillock overlooking the Arabian Sea, the Basilica of Mount Mary dates back to the 16th century when a chapel was constructed by Jesuit priests from Portugal. This magnificent quasi-Gothic structure has been on Mumbai's skyline since then. The original statue brought from Portugal suffered disfigurement at the hands of Arab pirates. In 1761, the broken hand of the statue was re adorned with baby Jesus in her arms. In 1954, this shrine was elevated to a minor basilica by Pope Pius XII. An oratory in honor of Our Lady of Fatima was built in the same year. 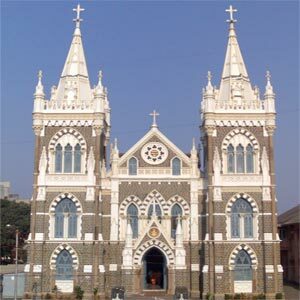 Mount Mary Basilica has received two Popes - Pope Paul VI (December 1964) and Pope John Paul II (February 1986). necessity. O Star of the Sea, help me and show me herein You are my Mother. Come September and the feast of Mount Mary at Bandra draws crowds from far and near. Celebrated on the first Sunday after September 8th, the week long celebrations or the Bandra Feast attracts people from all faiths. Thousands repose faith in Virgin Mary to grant favors and seek good health. People offer wax idols and candles in the shape of body parts, as part of their prayers to heal their sufferings. Masses are held every hour as devotees pour in from early morning. The air is festive, with festoons, candles, stalls, street plays, concerts and food festivals. Devotees pick up wax idols of Mother Mary, rosaries and bible. You can sample typical Goan delicacies like dodol, guava cheese and bolinhos. In fact, the black gram or chana sold here is referred to as 'Mt Mary Chana' and nearly no one goes away without munching it.